Here I have paired honeysuckle pink, beeswax yellow, and coral rose orange. Remember, when creating your color combination know that you may not be able to find the perfect “honeysuckle pink” to match the color you see online. Don’t fret a hue in the same color family will work perfectly for your big day. Remember to have fun and mix it up a bit. A dash of light pink here and there are lovely too. Look for many more inspiration boards to come! Enjoy!! Hi! My wedding will be on December 2011. Any suggestion color that fit for me? It will be held at Tagaytay. . . I like Honeysuckle Pink. . .
Hi, Michelle! We are getting married in 2012 and are currently in the planning process. 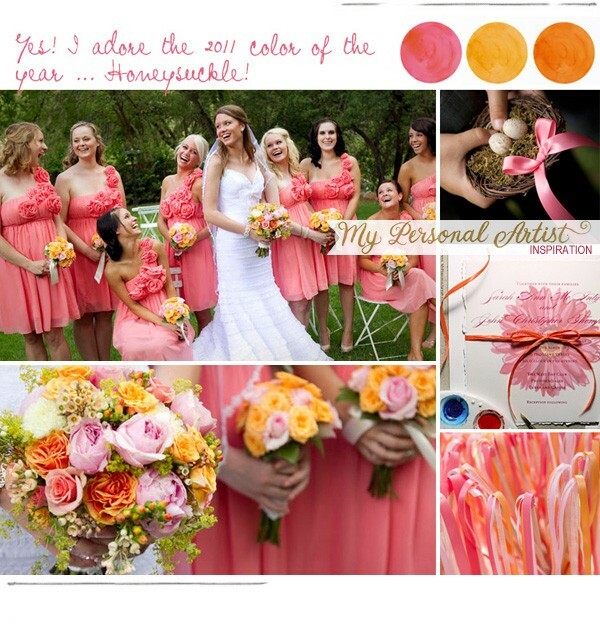 Is there a way to know as early as now what the wedding color trends will be next year? i have question.. we wanted to have our wedding on February of next year and use purple and silver for our color theme but we decided to have it in may and i don’t know and i have no idea of what color i can use.. so if u guys can help me it would be a lot of help thanx.. I love love love these bridesmaids dresses. Would love to know where to find them at! Help me, please!